Lena Dunham is an expert when it comes to enhancing lives that would normally be lived in miniature. 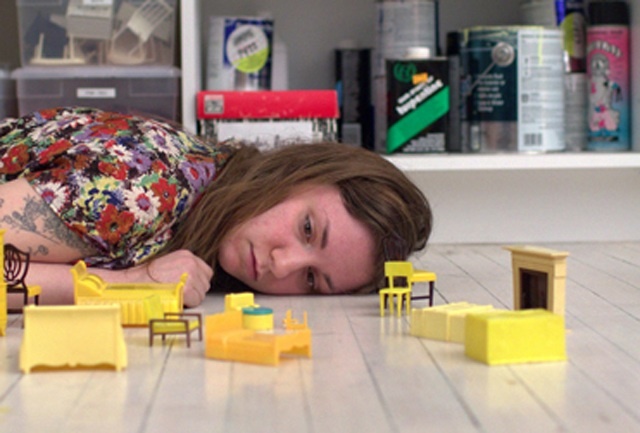 In her excellent feature debut, Tiny Furniture, Dunham magnifies the life of Aura, a recent college graduate who moves back home and seems stuck in neutral. In addition to writing and directing this film, Lena also plays the title character and has her actual mother and sister star as fictional versions of her mother and sister. Tiny Furniture is the definition of an independent film, and its formal sophistication and biting wit show up lesser attempts like Paranormal Activity. Dunham landed a gig on HBO with the Judd Apatow-produced Girls in part because of Tiny Furniture. The premise of that show is largely the same as this debut film on a larger scale. Dunham plays a young woman struggling professionally, financially and sexually. She does this quite well, reciting her own dialogue with an off-beat delivery that is a hybrid of a mumblecore character and actual human being. Thankfully, Dunham also knows how to compose a shot as well as a sentence. Though it’s clear that Tiny Furniture was made on a bare bones budget (some of the side characters are the wrong kind of awkward on camera), it is a very aesthetically pleasing film to look at. This is mostly because the upper class New York lifestyle that Aura’s mother (Laurie Simmons) and sister (Grace Dunham) inhabit is posh to begin with. Many prominent American indies have started to favor the Before/After plot device. Blue Valentine and the more recent We Need To Talk About Kevin are both examples of that style being used as a substitution for substance. Sean Durkin’s debut feature Martha Marcy May Marlene shows that device finally being used in excruciatingly well-done ways. Along with Margin Call, this film about a young woman traumatized by her time in a cult marks the best American writer/director debut of 2011. Durkin’s films is decidedly less slick than J.C. Chandor’s drama about the financial collapse in 2008, but they both become unflinchingly honest if very different portraits of American identity. The point of relation in this film comes from Martha (Elizabeth Olsen), whose strength after escaping the cult seems impossibly strong.